Also known as Broadgrin, the Gatormen are, as the name implies a cross between man and aligator. The Gatormen of Blackmoor make their home in the Barrier Swamp. This swamp marks the border between the Duchy of Ten and the Duchy of the Peaks. There have been many speculations to where this horrid race came from. One theory is that they were created by Lord Ran at the time when he controlled the Duchy of Ten. The Egg of Coot has been known to spawn a number of mosterous creatures, and Ran is reported to have stolen many of the Egg's secrets when he betrayed his former master. Although fellow swamp dwellers, Gatormen have no love for Froglin and are clearly not followers of the Frog God. Most likely they are followers of Demogorgon. 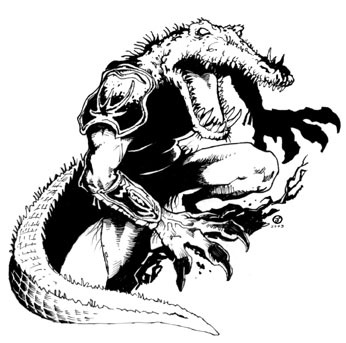 DA4 is the first recorded appearance of Gatormen, who later appeared in the D&D Creature Catalog. This means the race was invented by Dave Arneson or David Ritchie. They were later incorporated into the Red Steel Setting (Mystara) through Bruce Heard's excellent Voyage of the Princess Ark series. Red Steel offered no link to Blackmoor, but instead provided a much later creation date for when the race supposedly was created by a Wizard. It seems likely that this Wizard had discovered some old Blackmoorian scrolls which he used as a basis for his recreated race. Gatormen realllyy sounds like an Arneson idea to me. Like the frog folk and maggot men, just the sort of obvious yet deadly critter creations he liked. I always credited them to Arneson myself. I wasn't even aware that they might have a Ritchie origin. That makes sense guys. Thanks! 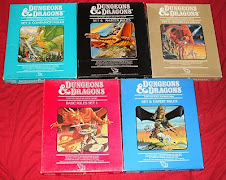 The DA modules introduced several new and unique monsters, most seemingly drawn from Arneson's campaign.